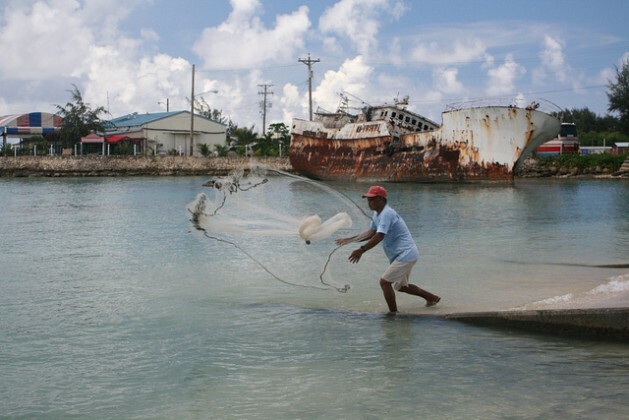 200 million people worldwide rely on fishing and related industries for their livelihoods. Credit: Christopher Pala/IPS. UNITED NATIONS, Jan 10 2017 (IPS) - UN member states hope to reach agreement on a diverse range of global issues in 2017, from managing the world’s oceans to banning killer robots to stopping tuberculosis, one of the world’s deadliest diseases. In recent years the UN has tackled big issues including ebola, the global migration crisis, financing for development and climate change, with varying degrees of success. Many pressing environmental, humanitarian and development issues continue to fill the UN’s agenda – even as incoming President of the United States has argued that things will be different at the UN after his inauguration on 20 January. Trump has suggested that the UN “is just a club for people to get together, talk and have a good time.” However UN discussions have led the 71 year old organisation with 193 member states to create more than 560 international treaties. One of the biggest meetings on the UN’s agenda this year is focused on the oceans or more specifically Sustainable Development Goal 14: Conserve and sustainably use the oceans, seas and marine resources. “The United Nations has the opportunity to drive profound change for the oceans in 2017,” Elizabeth Wilson, director, international ocean policy at the Pew Charitable Trusts told IPS. “This event will provide UN member states an opportunity to assess progress on ocean conservation, make new commitments, and create meaningful partnerships,” she said. The meeting – which will take place in New York from 5 to 9 June – is considered to be of global importance for many reasons. For example, according to a 2016 World Economic Forum report, there will be more plastic than fish in the world’s oceans by the year 2050. Declining fish stocks will effect the more than two billion people worldwide who rely on fish as a source of protein. The UN’s Food and Agricultural Organisation also estimates that 200 million people worldwide rely on fishing or related activities for their livelihoods, the vast majority of whom live in developing countries. Another important related issue on the UN’s agenda in 2017 will be working towards creating a treaty to protect the high seas, the areas of the global oceans, which fall beyond any country’s sea borders, said Wilson. The UN General Assembly has only ever convened special high-level meetings on two global health threats, HIV/AIDS and antimicrobial resistance. However in 2018, the General Assembly will meet to discuss Tuberculosis. Although the decision to convene the special meeting has been welcomed, it will not come soon enough for the nearly two million people who will likely die of tuberculosis in 2017. “The tuberculosis burden is much higher than we expected and the measures to be taken must be much more focused and serious than before,” Lucica Ditiu, Executive Director of the Stop TB Partnership told IPS. A series of global meetings will be held in 2017, in preparation for the 2018 meeting however, said Ditiu who also noted that these global meetings should not be seen as a silver bullet. Although tuberculosis is treatable, the emergence of multi-drug resistant tuberculosis in recent years is a major cause for concern. Multi-drug resistant tuberculosis is just one example of antimicrobial resistance – a serious health problem which world leaders addressed at the UN General Assembly in 2016. Possibly the most ambitious item on the UN’s agenda in 2017 will be an attempt to create an international treaty for the abolition of nuclear weapons. The first session of the UN conference to negotiate a legally-binding instrument to prohibit nuclear weapons, leading towards their total elimination will take place in New York from 27 to 31 March. The treaty will be a more ambitious iteration of the already existing Treaty on the Non-Proliferation of Nuclear Weapons. However proponents of total abolition of nuclear weapons will face an even more challenging political context in 2017, with US President-elect Donald Trump appearing to have unpredictable views on nuclear weapons potentially at odds with the existing non-proliferation treaty which bans new countries from acquiring nuclear weapons. Another, more contemporary issue on the UN’s agenda in 2017 will be killer robots. UN member states have agreed to begin talks to ban killer robots this year. According to the Campaign to Stop Killer Robots the talks will “(bring) the world another step closer towards a prohibition on the weapons.” A similar agreement back in 1995, led to government agreeing to pre-emptively ban lasers that would permanently blind, according to the campaign.